And he is just one of many such freaks who would do the earth a great service by simply removing THEMSELVES from the living population! At any rate; here is an excellent overview of the situation I recently came across on Rense.com. 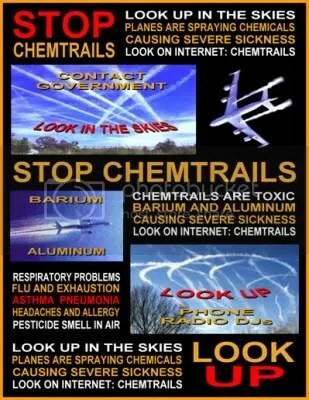 Please keep informing your friends and neighbors about chemtrails and ask them to LOOK UP IN THE SKY! Our only hope is to build awareness until the sheep wake-up and start demanding an end to this evil. Over the past three years, in order to investigate and observe more closely the vast weather modification across the United States and Canada, I have driven back and forth across the country four times. As part of my research, I also have met with some of the top scientists and researchers. What I knew to be the “United” States (now heavily manipulated behind the scenes by powerful corporations and compliant federal and state governments) today is hardly to be seen. Some of the US façade remains. But the very deep chasms (no longer mere cracks in our society) are evident everywhere. In fact, one could equate another level of our economic and political chaos with the explosions and underwater chasms in the Gulf of Mexico oil rig catastrophe. It is all part of the bigger, inter-related picture of destruction. From the shapes of the now-ubiquitous synthetic and often EMF clouds, there are several different weather modification programs active. In the Pacific Northwest (perhaps one of the most heavily environmentally poisoned geographic areas), sunshine is rare. This past winter, Oregon and Washington had mostly heavy rains and some snow for months on end. Both are now filled with an abundance of highly toxic heavy metals, including barium (damages the heart), aluminum, and mercury (the last two, long-term, both destroy brain function). People complained frequently in conversations about the lack of sunshine, but the corporate news never reports what is really happening. Driving north or south on Interstate 95 and east and west on I-84, there is further environmental damage noticeable. 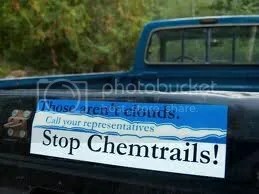 Chemtrails are everywhere overhead. Along both the Columbia River and on I-95 the clear-cutting of the magnificent forests is devastating to see. Where entire mountains have been clear-cut, desertification has set in. The whole ecosystem has been drastically altered. On some stretches of I-95, a thin layer of trees still stands on either side of the highway, as if everything is still in situ. However, I have taken numerous flights along California and Oregon. Seen from overhead at 35,000 feet, the clear-cutting is heart wrenching. Over the past 15-20 years, very little tree replanting has been done. Further, many stands of trees are noticeably unhealthy ­sick and dying. Most citizens are unaware of the ever-present environmental degradation and dangers, because very little is reported by any mainstream media. Portland, Oregon, is considered a beautiful city and residents consider themselves environmentally “aware” and green. Thousands bike ride and run daily. The tragedy is that most are completely un-informed about the many-layered chemical assaults with each and every breath they inhale. Chemtrails activity is extensive and heavy and the skies are constantly blanketed with a toxic grayish cover. The smell of chemicals in the air is often quite evident. Yet, when one mentions it, no one seems aware of the odor of chemicals. 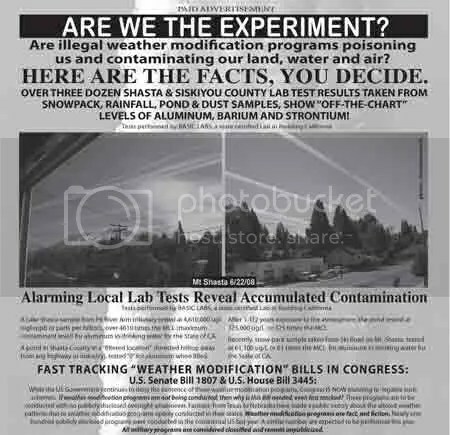 Clifford Carnicom, one of our country’s top Chemtrails investigators gave a public lecture in Portland, Oregon, in September 2009, and told the audience that “we are now breathing plasma and assorted poisons” due to Chemtrails and other illegal weather modification programs. (3) After his lecture, he spent another hour and a half answering questions. People want answers. The composition of our air ­essential for our very survival­ has been radically altered. Yet, no public official has replied to repeated concerns of thousands of citizens. In Orwellian doublethink, if public officials don’t respond to concerns or dismiss them, the issues surrounding toxicity don’t exist. 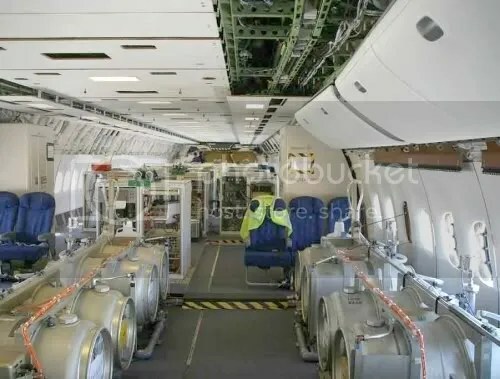 Over the past decade, Clifford Carnicom has focused more on analyzing, under a high-powered microscope, and discovering the probable causes due to the devastation wrought by Chemtrails. He has done ground-breaking research on the newly emerging and painful Morgellons Disease/Syndrome. So far, it is of unknown environmental origin. But it seems likely to have come from some secret bioweapons lab. The invisible nano-technology of fiberglass-coated aluminum, an integral part of these toxic aerosol sprays, has also contaminated the blood of millions of people. In order to discredit those with this painful illness, many medical reports erroneously deflect blame on to innocent citizens. 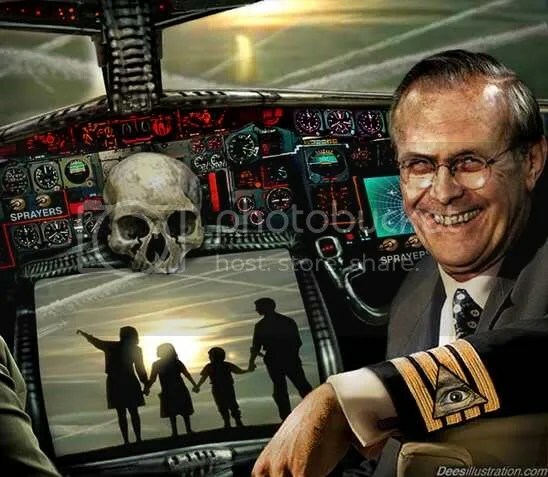 However, there is now ample evidence ­with Carnicom heroically leading the way­ to prove the links, both in humans and other animals, between Chemtrails, its “invisible” polymer fibers, and what comprises Morgellons on a microscopic level. In blood samples Carnicom has discovered: “an encasing filament structure”; and “a chalmydia-like organism (with chalmydia pneumoniathe strongest candidate thus far)an erythrocytic (red blood cell and likely artificial or modified] form; and some possibly Mycoplasma-like form. Carnicom has also discovered a replication process now found in this newly described “organism” (possibly some kind of synthetic blood); and it is in our mammalian blood (meaning our pets, too). 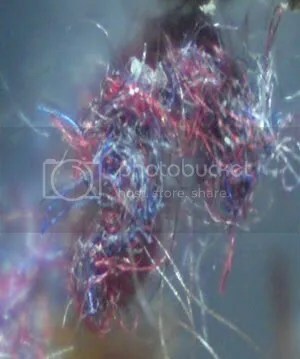 (4) Other aspects of his research show that these unusual biological forms were taken from an airborne sample. It was sent to the EPA; and they refused to examine it. There is no cure for this debilitating affliction, while we continue to be unwitting experimental animals. All of this is illegal both with federal and international laws. Yet it continues. The long-term effects of more than 12-15 years of illegal aerosol spraying (from military, private, and commercial planes), using all of us as uninformed test subjects, has resulted also in other chronic and multiple illnesses, such as upper respiratory diseases, cardiac illness, and high rates of brain dysfunction. (5) These are now at epidemic proportions and linked to the toxins in Chemtrails. These are often mis-diagnosed or undiagnosed, because most allopathic physicians have no training (or experience) in environmental medicine. It’s the proverbial elephant in the living room: what they don’t know, or can’t see, they cannot diagnose correctly. I saw this personally earlier this year with my two-and-a-half year old granddaughter. She was diagnosed with a tumor and urged to have surgery. The diagnosis was given by a pediatric specialist; but it was based only on a visual exam. No tests were done to confirm this diagnosis. The second opinion came from the child’s pediatrician (who had recommended the specialist). Neither doctor had any environmental background or training. I urged getting one or two other medical opinions before she was subjected to the trauma of surgery and my deep concern for the effects of anesthesia on a tiny child. Sadly, un-necessary surgery went ahead. In discussing environmental toxins with my college students (outside of classroom time), not one student was aware of these dangers. Yet, three of my young students (all under 30) have had major crises this past year: two had hysterectomies and another student was diagnosed with pelvic cancer and underwent chemotherapy. In a discussion with the Dean of Students, he told me there were staggering rates of illness that the college did not have 15 or 20 years ago. Looking back 25 years ago (if you are old enough), can you remember young children and college students having these major illnesses? We didn’t even have childrens’ hospitals then. Cancer is now out of control; and this won’t change until prevention is a major part of the equation. Allopathic medicine is often not about precaution or real care. It is all about supporting pharmaceutical companies (who make enormous profits on poorly or untested drugs and vaccines) combined with a medical system far too closely tied to the drug industry and supposedly “independent” governmental agencies (where, in fact, a revolving-door policy insures corporate management of the entire medical system). Doctors rarely have any environmental medical training, so the system supports drug solutions, not precaution and prevention. If we had the latter two, we would not have epidemics of cancers (especially children’s and now what used to be rare cancers ­some induced by cell-phone technology). A “cure” for cancer does not mean prevention. The existing situation will only become far worse than it already is with the supposed “health-care reform” ­in essence, “forced” care. This will only exacerbate the already out-of-control environmental crises we already have. California, the seventh largest economy in the world, already is under siege. The state has been bankrupt for the past two years. State employees are often given IOUs for their paychecks. State-funded universities (UC Berkley had huge student protests early this year) have increased tuition by 30 percent. Many public schools have been shut down, while students are bussed far away from their homes. Schools are in a shambles. US education has become LCD ­the lowest common denominator. Children are dumbed down, and then promoted from grade to grade, whether or not they know the now watered-down material. What then is the worth of a high school diploma? These educational deficits become major stumblings blocks with students who enter college and cannot read or write a coherent sentence ­let alone know how to write a small research paper. Remedial college classes now abound to help these students. When I moved to California 30 years ago, the state had the second best educational system in the US. Today, it ranks 47th. An ignorant and poorly educated population is easy to manipulate. Trivia is all important, while students are engrossed with their cell-phones, chat, and computer time. This isolating technology has become far more important than human interactions. Combine this with news that focuses on the irrelevant manias of starlets and sports idols (often with reprehensible personal habits), and one has the perfect recipe for an updated version of Roman decline. In addition, over the past eight years, California also has had drastic increases in arsons and extensive wildfires. Hardly anyone has been prosecutedeven when arson-related deaths [i.e., murder] have occurred. Having lived and taught in the state for decades, I speak from personal experience. The 1-million-acre FIRESTORM that hit southern California in October 2003 destroyed thousands of homes and businesses. Up to that time, it was the worst fire in the state’s history. There were 14 arsons that comprised this three-and-a-half-week catastrophe. My neighborhood of 2,000 was completely destroyed by CDF (California Department of Forestry), after our local volunteer firefighters had saved it. It was done for greed: the more the fires raged out of control, the more money CDF firefighters made. It was all covered up by a deceitful “Blue Ribbon Commission.” No one was ever prosecuted. Ethyl dibromide is a contributing factor in our skin’s dryness and accelerated ageing. It may also be a major factor in excessive Springtime pollen, increases in allergies, dry and itchy eyes, and other skin conditions. It is thought to be a major contributing factor in the pine beetle infestation and sudden oak death in thousands of dead and dying trees in southern California communities and national parks. Pine beetles can infest trees, when sap does not flow, due to (deliberately created) weather-modified drought conditions. These states have their own environmental problems. The once-gorgeous expanse of skies across the Plains states (Idaho, Utah, Wyoming, the Dakotas) are now often a washed-out grayish white across what used to be a magnificent, deep blue. Weird-looking, geo-engineered-synthetic clouds abound. 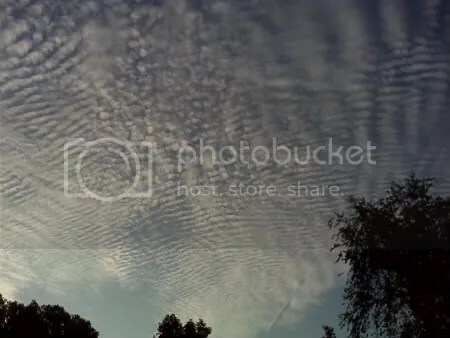 “Tentacles” of polymer fibers can be seen in thousands of these clouds. 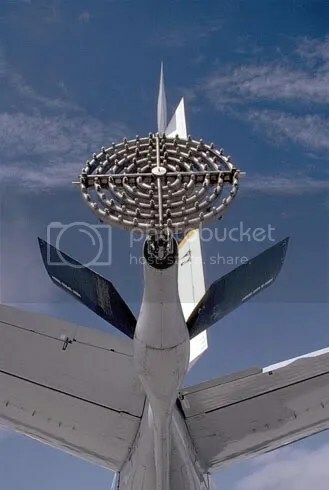 Local TV and radio weather stations never report the visible Chemtrails or the consequences of weather modification ­although everyone talks about the strange weather. The dots are not connected, while the “news” continues to be manipulated by insiders. Another alarming sight along Interstate 80 (going across Utah and Wyoming) is the current construction of possibly thousands of “road blocks” on what used to be “public” roads. All across the US, thousands of miles of roads have been repaved over the past three years ­and with them many newly posted signs, with large yellow lights, one-half mile before exit ramps, noting: “Warning, when lights flash, exit next.” If you don’t exit when these lights are on, the penalties include fines and jail sentences. [NOTE: photos were impossible to take, due to truck traffic.] Red and white gates (similar to those that lower at railroad-street crossings when a train passes) can now be lowered across the highway for whatever reason. These new gates are often at one exit after another. How many millions of taxpayer dollars went to potentially pen in cars and drivers and cut off traffic flow? There is no sane justification for thisexcept in a police state. Not two weeks ago, driving through Indiana, Illinois, Missouri, and Ohio, deeper-blue skies were visible for the first time. Yes, there was still a Chemtrails cloud cover, but often there were “holes” in these clouds where you could see the sky. The sky color there was a far deeper blue than I have seen in more than a decade. In personal conversations with Dr. Castle, he told me he is investigating the reasons for these changes. More news will be forthcoming, as there is new weather modification activity. Again, none of this is reported by mainstream news. For several years now, New England has been under constant aerosol Chemtrails assault [www.newyorkskywatch.com has been outstanding in regularly reporting the latest news]. This has dramatically altered the weather. Heavy rains and often mountains of snow and blizzards have been the changed winter weather. In the winter of 2007-2008, Maine had a record 16-feet of blizzard snow. In 2008, there was 8-feet of snow. Bitter cold and windy weather with sub-freezing temperatures of 30 and 40 below zero [Fahrenheit], made everything worse. As in the Pacific Northwest, sometimes there is barely any sunshine. This has affected crops significantly. Without the sunshine, there is less photosynthesis. Consequently, crops with green color now have a “washed-out” color ­not the vibrant dark-green they used to be. This also results in less vitamins and minerals in the vegetables we eat. The organic was movement started decades ago for us to have a safer food supply. This is now totally undermined by Chemtrails spraying. These poisons have entered the entire food chain and the planet’s web of life. Chemtrails, other weather modification assaults, and pesticides all destroy the nutritional value and safety of food that millions of consumers want and think they still have. This is a multi-billion-dollar business. The organic movement could supply a leadership role (backed by millions of consumers) in stopping the Chemtrails and other weather modification assaults. Economically, the East Coast is in a far worse crisis than is being reported. Last year, New York City’s Mayor Bloomberg closed more than 120 public schools despite vehement parental protest. Again, this is another indication of the disregard of legitimate citizens’ concerns. In Maine, many schools have also been closed this year, due to the broken economy that puts war expenditures ahead of social concerns. Busing students will lead to overcrowding in thousands of schools ­many of which are old and already in serious decay. Workers who have been hired by British Petroleum (now called Beyond Petroleum, but better called Beyond Prosecution) have been warned not to talk to reporters. Further, the beaches along the Gulf have been covered at night with sand from other areas (so it looks as though the beaches are untainted). What has happened is that the oil and tar has seeped deeper under the sand to contaminate the area further. No signs have been posted to warn children and adults of the dangers of swimming in toxic waters. The secret meetings between government officials, agencies, and BP continue to allow for the ecological destruction of an enormous area of the US and the Gulf waters. BP has one of the worst environmental safety records. Nothing is even remotely fixed. This used to be one of our planet’s most vibrant ecosystems. Now the contamination, death, and destruction will be with us for possibly generations. Oil has been found even along the Atlantic Ocean as far up as New Jersey. Any fish or crustaceans caught in the Gulf are not safe to eat. This is another tragic/epic example of how corporations ­with their legalized “personhood”­ have decimated the planet. We are all in grave danger, as our lives and our planet continue to be trashed by those in charge. As a species, we are failing miserably in being caretakers of our planet. This is our home. As yet, we do not have any Star Trek technology to go to some other planet. Further, global warming is a cover for the illegal geo-engineered destruction of our weather and atmosphere. I met last week with eminent international scientist Dr. Rosalie Bertell. She told me that “weather warfare” has accelerated around the globe. It is no longer just one dangerous h.a.a.r.p. [high active auroral research program] facility in Alaska. The US has another facility in Puerto Rico. Russia has at least one. Another one is at the South Pole. [This has been confirmed also by someone who has been to the South Pole and seen it.] So now, extreme weather (earthquakes in Haiti and China, floods in Pakistan and India) may be caused by the invisible and dangerous tampering of our planet’s atmosphere by more than one h.a.a.r.p. array manipulation. Dr. Bertell is the author of “No Immediate Danger” and “Planet Earth: The Latest Weapon of War. A Critical Study into the Military and the Environment.” These books are essential reading for everyone. Dr. Bertell is an internationally known scientist who, for four decades, has been involved in researching and reporting the dangers of radiation ­even supposedly low levels, which are generally and erroneously reported as not harmful. She is a recipient of the Right Livelihood Award and she led the international Bhopal and Chernobyl Medical Commissions. The US system is completely broken ­except for the wealthy and insiders who barely pay any taxes and live in gated communities. This is the new world dis-order devious plan of insiders. Checks and balances are gone. Congress is bought and sold and in thrall by big multi-national corporations. They are a big part of the problems ­not part of the solutions. Our Constitution has been trashed. It is no longer “we, the people.” Rather, now it is “we, the corporations and banks.” As I have written in my book, “The Uterine Crisis,” a corporation’s bottom line is profit. We only count, so they can continue their profits at any and all costs. We are all expendable for corporate profits. These crises are multi-layered, as Naomi Klein has written in her book, “The Shock Doctrine.” It is the intention of the wealthy and well-connected insiders to bring our country down. It is all being done by stealth and hidden agendas ­while lies and deceit abound. Yet, the Orwellian façade is crumbling, as more and more citizens are wrecked both physically and financially and see the treachery that is perpetrated on us. More of us are connecting all the dots, and realizing what we think we know is up for re-evaluation. There are outstanding writers, investigative journalists, and professors who have written extensively on the web to give us real news ­to report for the first time what has been hidden from the usual “orchestrated” history of school textbooks. Editors Michel Chossudovsky and Andrew Gavin Marshall’s new book, “The Global Economic Crisis. The Great Depression of the XXI Century” ­just published­ connects the dots of the many layers of our manipulated-behind-the-scenes economic disasters. Part of the over-all economic crises are directly related to both the private banking consortium of the Federal Reserve ­not accountable to anyone, yet stealing trillions of taxpayer dollars­ and the vast budget (more than three-quarters of the total US budget). The Federal Reserve banks have hijacked our hard-earned, but now worthless inflated fiat dollars. So, when most of our taxpayer dollars go for illegal wars and theft by the Federal Reserve, there is nothing left for vitally needed social services ­education, health and elder care, and other real social services essential to this country’s survival. All our social services are being deliberately destroyed, while the military budget increases astronomical and is thriving. Thomas Jefferson reminded us: “I sincerely believe the banking institutions having the issuing power of money are more dangerous to liberty than standing armies.” We now have standing armies on our soil –both the National Guard and foreign troops secreted here as well. This is against our Constitutional laws. Roadblocks are in place along well-traversed highways. Our entire web of life is rife with a highly toxic assortment of poisons and hormone-disrupting chemicals that surround our every move. Our children and grandchildren are in grave trouble; and they are our future ­if we are to have a future without a mindless robotic, soma-controlled population. This is where we find ourselves today. These crises are fixable, although it will take years ­and we are fast running out of time. But real ways out of these nightmares will only happen with a well-informed, well-educated citizenry who choose to find peaceful solutions to the illegal activities that are destroying not just North America, but much of the rest of the planet. PEACEFUL must be the operative word, as these criminals are already spraying us with a wide assortment of hazmat poisons. It is do-able, if we wake up. 1. “Army Starts To Burn VX Rockets In Umatilla.” Oct. 29, 2007: http://news.opb.org/article/637-army-starts-burn-vx-rockets-umatilla. Although not recently updated, http://www.scorecard.com does list, by zip code, which companies are releasing hazmats into the air, water, and soil.